For whatever reason this seems to be the day of “doing things I really don’t want to do.” It’s not 10AM yet, so things can only get better. Today, I’m taking a detour and writing about something different than money. More than three years ago, I wrote an article about Youngevity, a company that sells outrageously priced vitamins through MLM that appears to be similar to The $100 Pen Pyramid Scheme. I’ve learned that logic is not the strong suit of the people who have been scammed by such schemes. For some reason, they ignore the extensive scientific proof that vitamins are a waste of money for most people. That’s enough of a debate on it’s own which is why I wrote: Should You Be Buying Supplements?. However, what really is nonsensical is that the discussion has turned to genetically modified organisms (GMOs). I think these people realize they are fighting a losing battle and are attempting to pick a new one. I try to explain that it doesn’t help them defend Youngevity, but it’s tossing pearls before swine. In any case, I’d like to have somewhere to direct these knuckleheads. I don’t mind discussing GMOs, but I don’t want it to come at the expense of discussing pyramid schemes… and explaining why vitamins won’t cure cancer. In the immortal words of Captain Malcolm Reynolds, this is my port of harbor (when it comes to GMOs). I’m not going to defend GMOs as if they are 100% guaranteed to be fine. I’m simply going to present the evidence that I consider significant. First there is this from Pew Research. Specifically it seems that 57% of US adults consider GMOs to be unsafe and 37% consider them to be safe. However, if you consult scientists (the people who are most qualified to opine), the same research says that 88% consider them safe and 11% consider them unsafe. The stakes are high: As Newsweek writes, Scientists Could Save the World From Hunger, If We Let Them. Imagine solving world hunger. What a huge accomplishment it would be! These articles that I cite are long and exhaustive in their research. What if “fearmongering, errors, and fraud” prevents scientists from achieving such a noble goal of ending world hunger? I think you’d have be ten thousand percent sure that GMOs are greatly harmful and be able to quantify that harm before the bad outweighs the good. It is a seemingly never-ending battle to help prevent consumers from being scammed by MLM schemes. Today we look to examine another one of them: Youngevity. I had never heard of Youngevity. However, having looked into other MLM scams, I know one of the first places to look at is the cost of the product. Why? Because MLMs often require their distributors buy product to participate in the opportunity. The artificially expensive product pays the company hefty margins, and distributors often pay the surcharge month after month as a fee for what they feel will make them money. When I looked into the prices of Youngevity’s products, it had all the tell-tale signs of an MLM scam. Price per serving: $0.30 vs $1.25 in favor of Opti-Men. That’s a savings of a little more than 75%. With Tangy Tangerine, another concern I have is with the marketing of this product. On the bottle it says “with 115 vegetables and fruits.” There are no fruit and vegetables in 500mg of powder and certainly not 115. Anyone buying into this claim should take a bottle to their doctor or medical professional (who isn’t affiliated with the MLM) and ask them if you can stop eating vegetables because you are getting 115 from Tangy Tangerine. I image they’ll find that humorous. NOW Foods Omega 3-6-9 1000mg. It is around $15 for 250 capsules… 6 cents per capsule. If you use Amazon’s Subscribe and Save, you can knock that down another 20% for a price of around $12.50. Price per serving: $0.06 vs $0.30 in favor of NOW Foods Omega 3-6-9. That’s 1/5th the price or 80% off of the Youngevity price… and it gets even cheaper with Subscribe and Save. At this point, I got a little tired of searching, so I literally took the first thing that I found on Amazon and it seemed close to the Osteo Plus blend. Specifically, I am referring to: Enzymatic Therapy OsteoPrime Plus. I had to look at another website to get the nutritional information on this product as it wasn’t nicely available on Amazon. The nutritional information shows a more diverse blend than Youngevity’s Osteo Plus, but with lower amounts of calcium and vitamin D. These are the big things you’d be looking for in a osteo complex, so it looks like a bad fit. However, keep in mind that the Opti-Men product above had additional calcium and vitamin D, plus there’s the nutrients that you get from your regular diet. That should make up any difference. OsteoPrime Plus is priced at $17 for 120 capsules. However with 4 capsules per serving that is a 30-day supply on Amazon. The price for Youngevity’s Osteo Plus online that I saw was $41 also for a 32-day supply. Price per serving: $0.57 vs. $1.28 in favor of Enzymatic Therapy OsteoPrime Plus. This time the savings are closer to 55%. I should mention that these don’t seem to be random products that Spike picked out. They all seem to be part of what is calls the Youngevity Healthy Start package. This $112 product has the 30-day supply of all three Youngevity products. The price of this is combination on this site and this site is $112 (as of 4/27/2012). The later makes it seem like it a value as it normally costs $159.00. At $112, that’s $3.73 a day. The price of the three items that I listed above: 94 cents a day. That’s a savings of between 67-75%… or between $689.85 and $1018.35 a year. The typical case for MLM is that the quality of the MLM product is better than any you compare it to. Clearly if both products were identical Honda Accords you wouldn’t pay more. This puts the pressure on the MLM to prove that its product is significantly better. This is where they hire a couple of medical professionals as scientific experts, but the reality is that they are paid spokesmen. What you really need to know when it comes to vitamins is that there’s a non-profit organization that you can trust: the United States Pharmacopeia. You’ll find these products have USP Verified Dietary Supplement Mark on them. I’ve talked to a lot of pharmacists and they all say that this is the place to start and end your search for supplement quality… however many admitted to me that standards are generally so good they don’t look for it themselves and just buy the cheapest generic brand. Some commenters have tried to ignore this point about the USP. When they do, they often say that cheap vitamins aren’t absorbed well or that liquid absorbs better. It’s worth noting that there are no studies on Youngevity’s products absorption. If Youngevity’s products do absorb better than its competitors and this is indeed an important factor, why is there zero analysis on it? Another thing to keep in mind is that when researchers and scientists are researching vitamins, they often don’t choose liquid sources or even state the brand of vitamins at all. Why would scientists/researchers time and again choose to go through all the trouble of conducting studies with products that are known to be poor? The answer is that they aren’t using poor products. “Q. My wife pays a premium for liquid vitamin and mineral supplements, which are supposedly better absorbed by the body. Are they worth the cost? —D.P., Sacramento, Calif.
I’d add that even if she has trouble swallowing solid supplements, there’s amazing technology called pill crushing that has existed for years which solves this. When it comes to Youngevity it is worth keeping in mind the “Can I Pay Less for Something of Similar Value?” game. However, perhaps the biggest thing to consider is that recent research is showing that supplements may do more harm than good. It simply doesn’t make any sense to spend more money on something that doesn’t seem to work in the first place. Update (12/16/2013): The well-respected medical journal Annals of Internal Medicine says, “Enough is Enough: Stop Wasting Money on Vitamin and Mineral Supplements”. Many of the smartest people in the world have done the research on hundreds and thousands of people and haven’t anything that helps, and even found that it could be dangerous. It’s worth noting that Youngevity is associated with “Doctor” Joel Wallach. Who is he? According to Skepdic he is a veterinarian and a naturopath. I love animals and my aunt is a veterinarian, but I’m not taking advice for my own health from a veterinarian and person who bases their treatments on things that haven’t been scientifically proven. There are hundreds medical doctors in a few square miles from where I live that are hundreds of times more qualified that Wallach. I’d put nutritionists as more qualified when it comes to supplementation as well. I put “Doctor” in quote when referring to Wallach, because he’s a doctor in the sense that my wife, who has a doctorate in pharmacy (she’s a pharmacist) is a doctor. It’s a fair title for her education, but she doesn’t use the doctor title, nor does anyone else. A few commenters (mostly distributors) have asked about where I stand on the “Clemson study” on Youngevity products. You know what another word for “enhancing consumer demand” is? Marketing. In other words Clemson’s goal is to market nutraceutical products, and Youngevity pays them money for that. Ever hear of the rich person whose kid isn’t all that bright, but he got into the top college anyway? The school just happened to get a nice library donated by rich family. The parallels here are obvious. 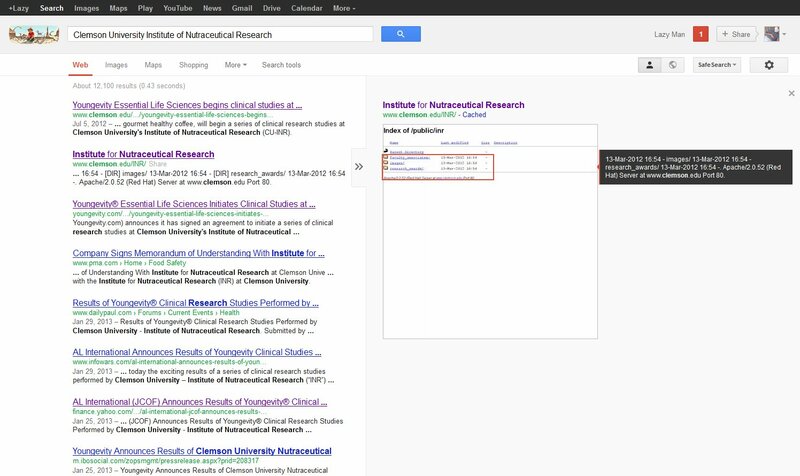 On February 5th, 2013, I noted that the website for Clemson’s Institute of Nutraceutical Research is not functional. Some may argue that I have the wrong URL there, but if I do, Google does too from this screenshot. As of this update, March 1, 2013, the website is still not functional. In addition to the website being down for nearly a month a Google search for Clemson Institute of Nutraceutical Research gives almost all results for Youngevity. I couldn’t find any other research it has done aside from Youngevity, which is an obvious red flag. Lastly as Commenter Mark Harris pointed out, Clemson’s INR is not listed on Clemson’s list of over 100 institutes and research centers (as of 12/30/2013). With the website being down for months, lack of information about other studies, and Clemson’s own failure to recognize it, is that it is hard to take the institute, and hence this research, seriously. With that said, I feel it is important to address the Clemson “research” itself. With that in mind, let’s take a look at the press release from AL International. One of the first things that pops of the page is that they classify the work as clinical research. However, it is quite clear from the study that this is laboratory research done on test tubes and not clinical research done on humans. Much of the press release focused on product safety. While we should all be concerned about safety, vitamins are generally considered safe, so such research is not necessary. If you were to read a review of a $200,000 car saying that it got people from point A to point B without exploding, you would probably be suspicious why they are focusing on something that even cheap cars should be able to do. You don’t buy a Ferrari because it doesn’t spontaneously explode, you buy it because it supposed to deliver an advantage over other cars. The other part of the article focused on kill cancer cells in a test tube (i.e. cell cultures). On the surface, this seems like compelling information. However, seven years ago we found acai killed cancer cells in a test tube. Not only acai, but according to this USDA article a number of foods kill cancer in test tubes. Heck, even pot slows cancer in tubes. Recent clinical trials, for example, suggest that supplements of single nutrients like vitamins B, C, and E and the mineral selenium do not, as once thought, prevent chronic or age-related diseases including prostate and other kinds of cancer. Some substances, like green tea and ginger, seem to have potential in preventing or helping to treat cancer, but they may also actually interfere with treatment or have other serious side effects. Meantime, countless substances that kill or slow the growth of cancer cells in a test tube have not shown that same success in human beings. So Youngevity, and it’s various ingredients are added to the list of “countless substances that kill or slow growth of cancer cells in a test tube”, but “have not shown the same success in human beings. Here’s a thought from a pharmacist that I know and trust: “Bleach kills cancer cells in a test tube… I’m not going to drink it any time soon.” She might have been joking with the last part, but the point is clear: We are not test tubes. Few test tubes read this article… and they aren’t concerned about cancer. Many more humans read this article and I presume they are more interested in the fact that the research does not show success for them. This brochure with “anti-cancer” prominently in the title and throughout the brochure appears to be evidence of the product’s intended use. The small box at the end of the brochure reading “These products are not intended to diagnose, treat, cure, or prevent any disease” should tell you everything you need to know about Youngevity and cancer in clear and in no uncertain terms. Finally, the New York Times cautions against reading anything into these studies. It is a highly important article for all consumers of any health products to read and understand. Bottom Line: Clemson duplicated research that was already well known to be irrelevant in an attempt to provide marketing for Youngevity. They didn’t do any clinical trials (tests in humans) of the product, presumably because they knew in advance it wouldn’t have given the positive result that Youngevity paid for. When Youngevity puts out a press release saying, “The INR is a national leader in nutritional research and one of the most highly regarded organizations in the field of phytonutrients, vitamins and minerals” it is clear that it is complete bovine excrement. Truth in Advertising has archived the Youngevity Pamphlet on the Clemson study and has added it to it’s Youngevity Health Claims Database. They wrote a great Youngevity information article themselves that you should read. I’m not a legal expert, but it sounds to me that the spokesperson is saying that Youngevity shouldn’t have produced the pamphlet. It seems that Youngevity is coaching its distributors to say that today’s soil is depleted of vitamins and minerals in order to create demand for their product. It sounds plausible until you look at little deeper. Behind the deception there is a nugget of truth, which is what they use to sell you down this erroneous line of thinking. There is some credible information that some soil is deficient of vitamins according to this Scientific American article that cites a few sources. It is far from conclusive. That’s problem #1 with the argument, but for sake of argument we’ll pretend it is conclusive. There are a lot more problems. A Youngevity distributor pitching this has made the bad inference that because we might be getting less than before we aren’t getting enough. If McDonalds cut the calories of its Double Quarter Pounder you probably wouldn’t be looking to add more to make up for “a deficiency.” It’s quite possible we were getting more than we needed in the past and still get enough (which I will cover in a minute). That’s problem #2. I’ve added emphasis to three important parts. Supplements are not advised… problem #3. There is no evidence of micronutrient deficiencies in the United States and in other countries. This supports the point I made above in problem #2… we get enough. In fact, the people who are looking into Youngevity are probably those who are health-conscious and thus more likely to have a healthy diet that is devoid of deficiencies. The final point the article makes is that supplements might even be harmful. That’s problem #4. You not only don’t appear to be helping yourself, but you might even be hurting yourself. I’ve heard people try to discount that article and the science. They do everything can (like the “sickness industry” I mentioned above). I can’t understand how these people believe in some science and not others. They’ll take the whole thing about depleted soil as a given even though there’s far less analysis of that and throw out all the science about vitamins and minerals not being helpful. It’s as if they want to believe in addition, but not multiplication. It simply doesn’t make any sense to pick and choose arbitrarily. And then there is problem #6 to this argument. It doesn’t give anyone a reason to buy Youngevity’s overpriced supplements (using the above analysis). improvements in transportation allow for better access to a variety of fruits than in the 1950s. the diet in the 1950s was not very good (“potatoes and iceberg lettuce” cited), there is much more nutritional awareness today. I tried to give a fair review to Youngevity based on its products in general, but as I’ve found in every MLM that I’ve looked at, the organization usually is centered around a few charlatans. The story is truly amazing and should make it very clear that it best to avoid Youngevity and its marketing tactics that aren’t properly supported by any real evidence.